Product Spotlight: Enterprise Reporting 3.3 Released!!! Prolink is very excited to announce the release of the Enterprise Report Scheduler v.3.3. The new ERS features a whole host of new innovations in charting and reporting allowing you to filter and group your data any way you choose. 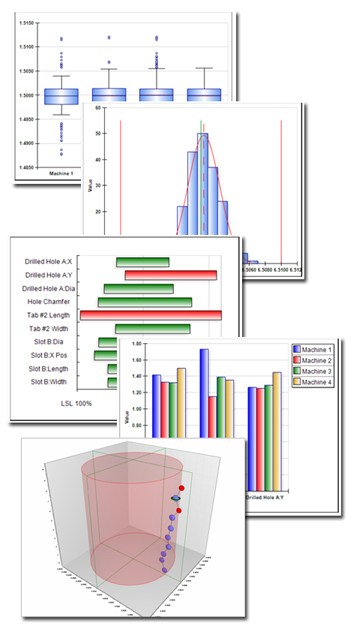 Advanced Interactive Analysis - The new interactive analysis screen allows you to filter and group your data on the fly, drill into the various charts, and find issues with your process. * New * First in the Industry 3D True Position Chart allowing you to drag and rotate your data in 3D space. An expanding list of 16 different report types can be memorized directly from the analysis screen. New filtering options allow you greater flexibility in grouping your data. An enhanced data view with color-coded cells for out of spec, attached notes, and deleted points. Ownership features preventing others from inadvertently changing your reports or exports. Download the latest version of ERS on our website at http://www.prolinksoftware.com. Don't have a SQL Database? No problem! Use ours. Prolink has provided a sample database on our website for use in ERS. The first time you run ERS, simply choose "Use Prolink Sample Database" from the wizard that appears and we'll take care of the rest. Tip: Freeform notes in QC-CALC?? Yup! In QC-CALC Real-Time 3.3, right click on the point where you want to add a note. From the popup menu, choose Assign Notes. The Notes dialog will appear. Enter a note and click OK. The point to which you assigned the note will turn light blue. To view your notes in a panel like Point Properties, choose View > Data Notes. 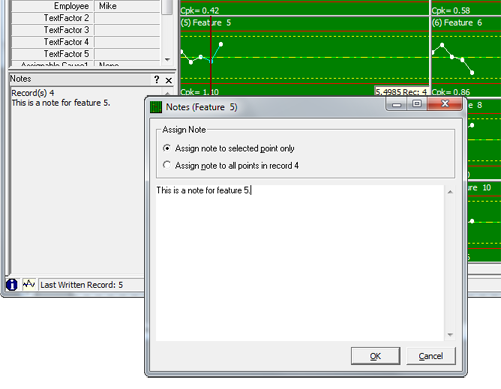 When you move the mouse over points containing notes, the note will appear in the Notes panel (pictured at right). To assign a note to all features in the part, simply choose the second option when entering the note. QC-CALC will assign the note to all points and turn them all blue. If you are using subgroups, the note is automatically assigned to the entire subgroup. All notes functionality works identically in QC-CALC SPC as well so type away! Download the latest version of QC-CALC Real-Time 3.3.